Celtic versus Rangers, Manchester United versus Liverpool, River Plate versus Boca Juniors, Barcelona versus Real Madrid and so on. These are the answers that roll off the tongue of football fans all over the world when asked what the biggest derby in football is. However, in an Irish university located between Ballymun, Santry, Glasnevin and Whitehall there is a rivalry that goes above and beyond these. A rivalry so great that it is played in honour of one of Ireland’s most revered broadcasters, despite the fact that he barely knows of its existence. 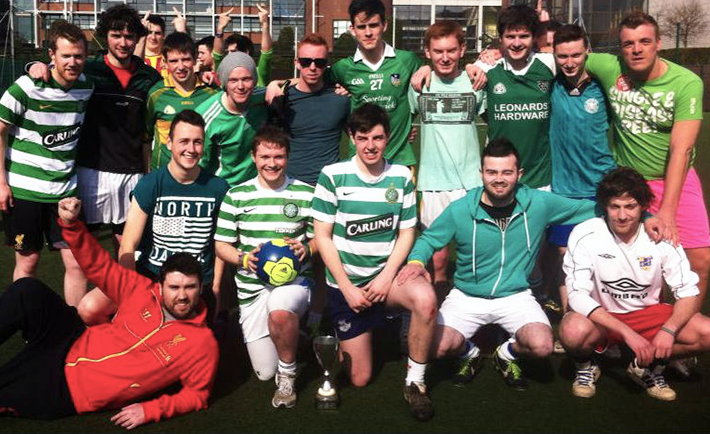 It is of course the annual Bill O’Herlihy Cup between The College View and DCUfm. A five-a-side (becoming six-a-side three quarters of the way through) match played each year as The College View don their traditional red colours to take on the green of DCUfm. Played out in the bubbling cauldron of emotion that is AstroTurf pitch number five at the back of the DCU Sports Centre, this year’s contest had everything that makes a derby a derby – tough tackles, spectacular goals, heated emotions and an almighty sting in the tale at the end made the fifth Bill O’Herlihy Cup the best yet. In the days leading up to the match DCUfm had been rocked by the news that their deputy head of sports, Cian Roche, had made the switch to The College View for a fee believed to be in the region of €0.50c and two cans of Strongbow. Signing the deal at The College View’s Hampstead Training Complex Roche said he was “delighted to link up with The College View” and felt that it was “a great opportunity to play with some of the best players DCU has to offer”. DCUfm team manager Eoin Sheahan was said to be disgusted at the manner in which the newspaper had carried out the deal, saying that they had gone completely over his head. More drama was to follow however when College View team manager Ruaidhrí Croke made an appearance on DCUfm’s Action Replay, along with Roche, just hours after the deal had been completed. Examining the contract during the show Sheahan noticed that it had been signed by Michael Cogley under the title ‘Editor-in-Chief’, despite the fact that Cogley had yet to officially take on his role as the head of the paper. The radio station subsequently lodged a complaint to the FAI and successfully had the contract declared void. Tensions had reached a climax by the time the two teams took to the field of play and the opening minutes were tight with both sides looking nervous on the ball in front of the large crowd that had gathered to witness to hotly anticipated contest. The deadlock was eventually broken by The College View’s Michael Cogley when he slotted the ball past Ross McCarrick in the DCUfm goal to give the newspaper the lead. The lead didn’t last long however and it was only a matter of minutes before DCUfm equalised and then took the lead themselves. With McCarrick in goal and Mark Kelly dictating the play from the back it was the radio station that was on top of the game while The College View battled to stay in touch as Odrán de Bhaldraithe was forced into save after save. With DCUfm’s squad easily outnumbering that of The College View it was never going to be easy for the newspaper as the warm weather took its toll on the players. When half-time came DCUfm had built up a two goal lead and managed to increase it to four shortly after the restart thanks in part to Mark Kelly’s long range strike that was the pick of the goals. The College View weren’t going to give up that easily however with goals from Paul O’Donoghue, Michael Cogley and a brace from Ruaidhrí Croke taking the scoreline to 8-8 with less than 10 minutes to go. The College View were now on top and pushed for a winner but were denied by the brilliance of McCarrick. Neither team could grab a winner however meaning the game went into a penalty shootout. With the record books showing that the sides were locked on two Bill O’Herlihy cups each the penalty shootout was of paramount importance. After five spot kicks the sides were tied and the shootout entered sudden death. Stepping up for The College View Odrán de Bhaldraithe put his penalty wide of the mark leaving DCUfm with the chance to clinch a second consecutive Bill O’Herlihy Cup. There was to be yet more drama however as Cian Roche, the man at the centre of the week’s transfer saga, stepped forward to dispatch the winning penalty and ensure that the trophy will remain in the DCUfm studio for another year.